with SAP GUI for Windows 7.50 we have started the deprecation of the old themes “Classic” and “Enjoy” (including “Stramline” and “Tradeshow”). “Deprecation” means that we will not invest into these themes anymore and that we will remove them from the release following 7.50 (which is likely going to be called “7.60”). This is intended as a heads-up information for all who are presently using “Classic” or “Enjoy”. After the upgrade to SAP GUI for Windows 7.60 users who had selected “Classic” or “Enjoy” will get the default theme of the new release instead. This will likely be Blue Crystal Theme and Belize Theme (for SAP S/4HANA). For compatibility reasons we will not apply any changes in release 7.50. Is this available for download ? yes, SAP GUI for Windows 7.50 is available for download on SAP Support Portal since 10th of May 2017.
when will 7.60 be available? SAP GUI for Windows 7.60 is planned to become available in late February 2019. However, as usual, we won’t guarantee this. An old question: Is, or will the GUI ever be available for download without an S-ID? This is really frustrating, as people don’t always have S-IDs, or sometimes only S-IDs without download capability (as is the case for me now). But I’d still like to get the latest GUI patches for use with my own developer system. no, this is not going to happen as far as I can see. 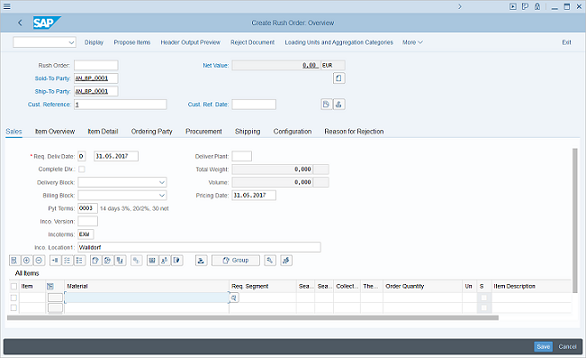 The license conditions for SAP GUI demand that you are an SAP customer to be eligible to download SAP GUI. Thanks for the feedback. But it seems to be a somewhat arbitrary license restriction. I mean, why? Firstly, it is possible to obtain it from SAP without a customer license, as it is included in several other free packages I can get with a P-user. But it may be a slightly outdated version or not the platform I want. Secondly, if someone really wanted to get it, a copy can be found on the internet. So the license won’t stop anyone from getting a copy if they really wanted it. It just makes it risky as we’d potentially be downloading it from an unknown source. So… what is the point? As a non-customer I can run a trial version of NetWeaver, so I’m licensed to use it but not download? I’m licensed to download it as part of a bigger package, but heaven forbid I might want to apply a patch? Of course I understand it’s not your rules, so my ‘rant’ is more at your bizarre legal setup. Old post, but still relevant. Do I see this correctly that this was the last possibility to set different colors for different Systems? With SAPGui 7.50 it’s also possible for Blue Crystal to set different colors for different systems. 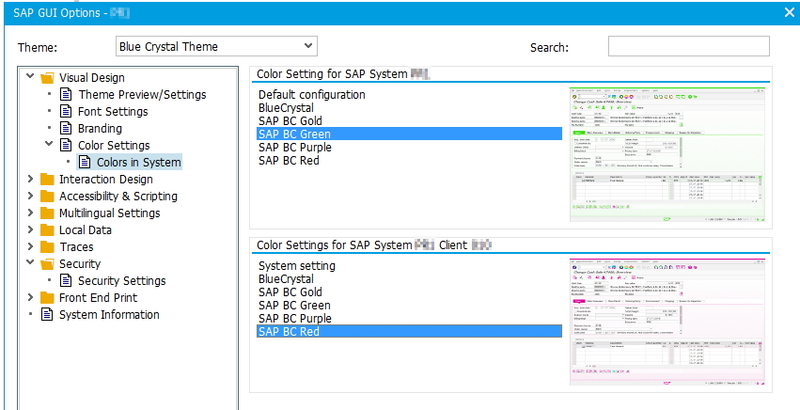 with SAP GUI 7.50 you can set different colors for your systems with Enjoy, Signature (since 7.30) and Blue Crystal (new in 7.50). But: Why do you still keep Signature and Corbu around? Wouldn’t Blue Crystal and Belize be enough?! in 750 is still available to store login password? I had just installed 750 and I have some old shortcut with stored password, but now doesn’t work! Storing passwords in SAP Shortcuts is technically still possible, but I do not think that this is a good idea. Anybody who has access to such a shortcut can log on to a system with your user. It is much better to use SSO solutions than to take such risks. Is it possible to use Belize theme with non S4HANA servers?,and if not, is it planned to support older ECC servers? Belize introduces much more fundamental changes than the previous themes. One big aspect is the screen metrics, but there are others. Therefore we recommend to check and adopt applications before running them with Belize. At SAP we did this intensively for the S/4HANA applications and we modified a number of them. These changes are only available for S/4HANA. Do you know if it is possible to use Belize theme with ECC6 EhP8 ? Or is it only from S4HANA 1610 ? Belize is a new feature of S/4HANA 1610 and newer releases (see my reply above). Do we have a way where we can disable Fiori visual theme at packaging level ? sure, this is a normal feature which is part of the options dialog and can be rolled-out via distributing a registry value (for example via a script action in the installation package defined with NWSAPSetup). The administration guide also explains how to use the read-only feature to make individual options disabled if you want to do that. Thanks Frank . . .. I have a New Question related to SAP GUI 7.5 . Can we Remove Registry keys as well whenever we uninstall Previous version of SAP GUI and Install SAP GUI 7.5 . Let me elaborate more : We have Installed SAP GUI 7.4 in a Machine where we added some customizing script. we want whenever we uninstall any older version of SAP GUI it deletes the entries in Registry keys as well . Can we do it using Scripting ? NWSAPSetup offers features that allow you to add specific actions to installation packages. This can for example be the creation of registry keys / values. In my opinion your should investigate this option. The SAP GUI Installation Guide and the documentation available in an SAPSetup Installation Server will help you. We get our icons back in the fiori like theme? we are thinking about introducing an option for bringing back the icons in header and footer in Belize theme. However, if this comes, it will only come for a new release. There are quite different opinions on whether these icons increase usability or not, but my personal opinion is that we should better give power users the choice. It would be great, if the icons come back. First time i saw the new theme (belize), i said to me: “they forget the icons”, but then i read the release notes. Because of missing icons, i do not use this theme. I definitely agree with empowering users by providing the option of the reintroducing the icons. Some users prefer to have as many functionalities within the same screen (i.e. icons) which can be faster to navigate for experienced users while others may prefer clarity with the menu text (i.e. current Belize). So, having an option will definitely be great. we have just finished the implementation of the return of the icons in Belize theme for SAP GUI for Windows 7.60. Since this indeed has a very positive effect for users, we will make this the default in SAP GUI for Windows 7.60 (however, there is an option to turn off the icons if you want). Is this blog about SAP GUI 7.6 or 7.5!!! the removal of the Enjoy Themes will come with SAP GUI 7.60 – for SAP GUI for Windows 7.50 nothing will change. You are right in saying that the discussion in this blog is a bit mixed between the releases. Is there any way we can get this GUI? you can get it in Q1/2019 (late February is our plan). We are not running a Beta program this time. Thank you for providing the timeline. you won’t have to miss Classic, because we have decided to keep supporting and shipping this theme. However, we will remove the Enjoy modes (Enjoy, Streamline, Tradeshow). The decision to keep Classic in was taken based on feedback of users who like Classic and it is also based on the fact that we ourselves almost gain nothing from removing that theme. One question: How to increase the number of items in tables and ALV lists on the belize? This is just counter-productive if you ask me as users need to do more navigation to enter / view the same data. unfortunately, there is no way to achieve this unless you reduce the font size in the SAP GUI settings. The metric of the Belize theme was designed to be relatively big and the visual effect of this change is indeed quite strong. On the other hand this reduces the amount of data on the screen. This is why we implemented a different line height for tables, ALVs and ABAP lists in Belize (26pixels instead of 32pixels). So this is desired by our designers. Is there any way we can get this new version of GUI since we are planning to upgrade our SAP GUI for more than 1500 users at a time? If yes, Can you please send me direct message that would be helpful.